Please sign up for our mailing list – you will be the first to know about events and new season stock. We don’t plan to bombard you and of course, please let us know if you want to be taken off. For enquiries, please get in touch via the contact form below. 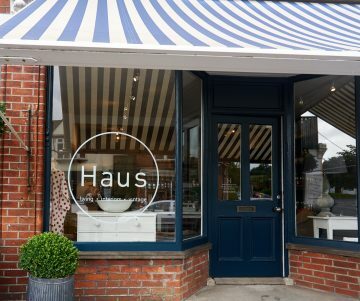 Haus is situated in the picturesque town of Haslemere, in the south-west corner of Surrey and on the borders of Hampshire and West Sussex. Located just off the A3 south of Guildford and approximately 50 miles south of Central London. From the A3, towards Portsmouth turn left onto the A287 Hindhead Road towards Haslemere and Midhurst. Haus is approximately 2 miles along this road on the left hand side just before the Esso Petrol Station. From Haslemere town centre take the B2131 through Wey Hill towards Hindhead and the A3. Haus is on the right hand side just after the Esso Petrol Station. Customers are welcome to park on the tarmac in front of the shop.